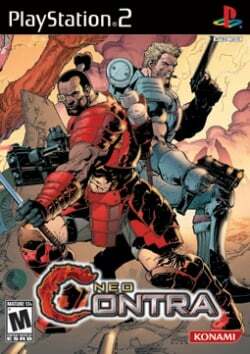 Game description: Neo Contra integrates all the classic shooting elements from the Contra series into 3D environments. Set in the distant future, the game continues the adventure of the legendary hero, Bill Rizer, and introduces a new character to the series--Genbei Jaguer Yagyu, a mysterious samurai. As Bill or Genbei, you'll fight huge bosses and deadly enemies with an arsenal of powerful weapons. Neo Contra also features realistic environmental destruction, explosions, and cinematic cutscenes. USA v02.20(10/02/2006), (2 patches), Really very light game for any cpu/gpu. can occur crash in the screen,but difficultly. USA v02.20(10/02/2006), I checked both the PAL & NTSC versions and neither works. Both hang at start of Level 2 if game fixes are enabled. And both hang at start of level 1 if game fixes are disabled. So overall the game can not be played since there is no way to save the game midway and disable game fixes. PCSX2 1.3.0 SVN GsDx SSE2 / ZZOgl ? MTVU Hack and MVU Speed Hacks, recommended used. Runs at about 45FPS on GsDx SSE2 Hardware, 20 in ZZOgl. I don't crash.. Description: The background layer (e.g. the water in stage 1) is corrupted in both hardware and software mode. This page was last edited on 27 December 2016, at 15:17.